Working in a creative multi-discipline environment like Bakehouse is an exciting place to be, surrounded by people with such a variety of skills is inspirational on a daily basis. Creative tools range from illustration, photography, filmmaking and tailoring, to poly carving, carpentry, welding and puppet making. Such an array of creativity all under one roof makes for an eclectic and electric working environment! However each year in February I get the opportunity to move my workplace over the Severn Bridge to The Royal Welsh College of Music and Drama (RWCMD) and be surrounded, and inspired, by the next generation of creatives. 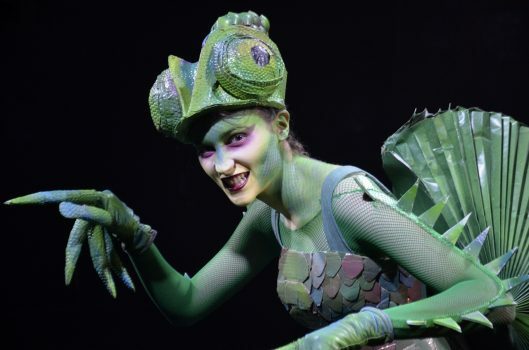 The Theatre Design degree at RWCMD is a rigorous and challenging course, and I am lucky enough to have choreographed their Wearable Art show each year since 2010. This show involves the retelling of an Opera in the form of a theatrical catwalk show – the stars of which are the designers themselves, who have to design, make and then showcase their creations over a series of sell-out shows in the college’s Bute Theatre. We find a mixture of music that reflects the characters and costumes designed (ranging from Mozart to Metallica), and embark on an intense week to create a show that brings out the best of both the costumes, the students and the narrative. Every year I am blown away – with such skill and vision in their creations, and guts and hard work to perform outside of their comfort zone. The result? A show that everyone is proud of, and a chance for audience members to be inspired. We are delighted to have a great relationship with RWCMD, with many students joining our creative team at Bakehouse after graduation. Among them Jess Jones (puppet maker) and newest member of the team Katie Hart (production designer), both of whom I directed as students. In the audience each year you will find our own costume designer Sophie Littin who completed a Bachelor of Fashion Design (Hons) in 2012 at Massey University in Wellington, NZ. Here we ask her a bit about her background in wearable art. In 2011, I entered the international design competition World of Wearable Art, a show that gives designers the opportunity to be innovative, original and to push the boundaries of creativity. I won the Student Award and second prize in the Avant-Garde section. This same entry also made me eligible for a scholarship to study at the Academy of Art in San Francisco, CA. It was here that I studied fashion illustration, shoe design, consumer motivation, and costume design. 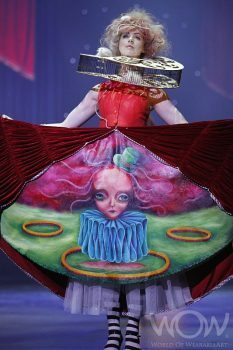 I entered the World of Wearable Art competition with a piece called The Greatest Show, which was constructed using fabric, and traditional painting techniques, bird cage, laser cut plywood, and a reconstructed wig – and a large handmade rat! In the costume department at Bakehouse, we specialise in making one-off costumes for any kind of event, using any and all of our supplies which lend themselves to a multitude of requests. If you need a fruity dame wig, or a velvet pillbox hat, a pompom headband, or a feathered bird of paradise headpiece, this is the place to come! Life’s a catwalk – go make some art and wear it!